Thanks for checking out my new website and blog. The purpose of the blog is to entertain and perhaps occasionally educate my readers. What will be covered in my blog? Well, mostly observations on life with an emphasis on entertainment and food. 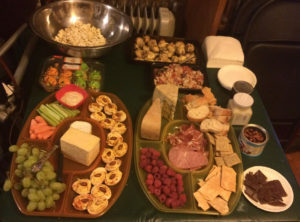 A sampling of hors d’oeuvres. food and cooking, tips for dinner parties, overcoming epic culinary fails, making/keeping friends, trying new things to be active like going on scavenger hunts or participating in room escapes, going on Meetup.com adventures, making the most of coupon sites like Groupon or Living Social, how to be a tourist in your own city, getting out of a rut, using all aspects of Craigslist to enrich life, why daily comic strips are essential to living a happier life, time management, when to choose alone time vs being social, how to be politically independent when you may be in constant disagreement with your friends, workplace solutions, new cocktail trends, roommate misadventures, the world of non-profits, navigating through complex adult-child family conflicts, why Alexa Echo Dot is so cool, health insurance successes and failures, walking the line between being a feminist and a traditionalist, celebrity deaths, skincare–what are the best creams and beauty products for every age, the coolest unknown facts about Comic Cons, when to rock red lipstick, and how to cope with having to wait so long for the return of Game of Thrones and Outlander. When it comes to entertainment, I am graduate of Columbia with a BA in Film Studies, but my love of movies, TV and all things pop and geek culture extend further than my traditional education. I am an avid fan of Classic Movies and Hollywood trivia. Also, I will tell some behind the scenes tales of my celebrity interviews and my work with www.thecelebritycafe.com. But, there will be more. I tend to see the world a little differently than most, and I can find humor in almost everything. Sometimes I will discuss work and workplace dramas including frustrations and successes. My family is a constant source of funny material. I am a skilled home cook who typically makes Puerto Rican or Southern dishes. Comfort food is king in my kitchen.